Here’s our newest addition. 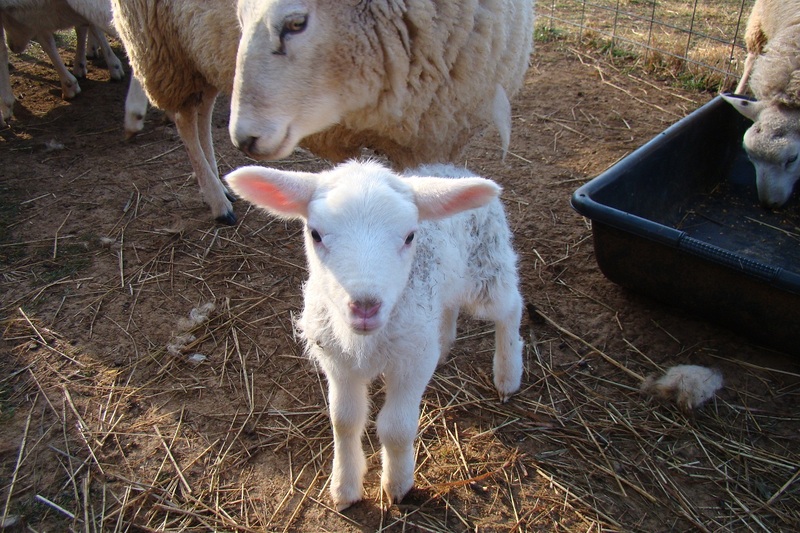 This lamb’s mama is probably the best in our flock. After every baby is born on our farm, we dip their navels in an iodine solution to help sanitize and keep germs at bay. That process obviously requires catching the lamb. When we grabbed her, mama freaked out because she couldn’t see her on the ground any more. She immediately decided our border collie had taken her (an obvious conclusion if you’re a sheep) and charged her. Repeatedly. We gave Jenna permission to protect herself. That command is called ‘GET IT!’ Lots of ramming (the ewe), lots of nipping (Jenna) and lots of screaming (me!). Jenna’s only got three legs now and can’t turn on a dime any more. We shoved the lamb in the ewe’s face and they trotted off in the rain. We had considered putting them in the barn for the day but decided mama knew what was best. Jenna seemed exhilarated by the experience. What could be better than getting permission to nip a sheep?? Funny, I don’t remember the sheep nipping the ‘wolves’ in Babe. We’ve been made out to be the bad guys once again.